If there is a considerable amount of dust in your house despite regular vacuuming and/or everyone sneezes and coughs more than usual, then air duct cleaning may solve the problem. HVAC ducts can hold contaminants of various types and sizes. But why does this happen? A large amount of dust is produced in the house every day. It may not be the most pleasant thing to hear, but the biggest portion of house dust is formed by the dead skin cells of its inhabitants. Additionally, dust, dirt and debris particles are brought from the outside. Pollen is also carried inside through windows (even if they are netted) during spring. All of these particles lower the home indoor air quality. Regular floor and upholstery vacuuming helps to remove the contaminants that are on the surface, but the ones circulated in the air are picked up by HVAC system through the air flow which it creates around the house. Some of them build up in the HVAC air filters, but a portion remains in the air ducts. Over time, the accumulation of contaminants in the ductwork grows and the quality of the indoor air is reduced even further. That is why regular cleaning is essential. This is actually one of the main reasons for contamination of the air ducts and the inefficient performance of the entire HVAC system. Without regular air filter cleaning or replacement, more contaminants will get into the system. If the drainage system isn’t maintained properly, mold can grow and spread to the air ducts. Usually, leaks are the result of improper sealing - they cause air to be exchanged between the HVAC system and the surrounding environment. As a result, more contaminants enter the system on a daily basis and build up faster. What's the solution? 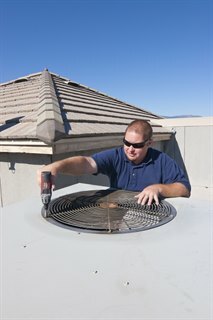 Air duct seal repair is required in the first place. It will eliminate the leaks and improved the indoor air quality.